Windows 8 and 8.1 hide the compatibility property sheet for certain programs (namely programs included with Windows, like Notepad, and those on a whitelist of programs known to run correctly on Windows 8/8.1 – defined in %WinDir%apppatchpcamain.sdb). 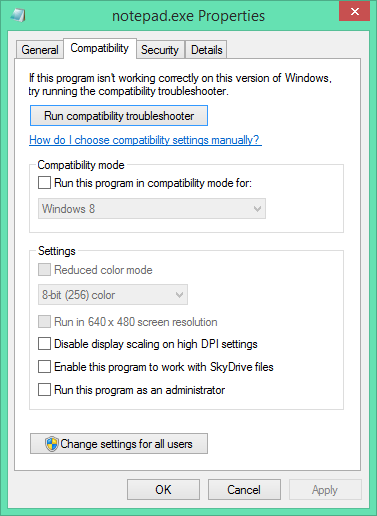 In some cases, one can still run the ‘troubleshoot compatibility’ wizard by right-clicking on the file, which just presents compatibility settings in a novice-friendly, poweruser-unfriendly way. The compatibility property sheet and context menu are defined in acppage.dll. By patching this DLL, we can enable the compatibility property sheet for (almost) all programs, including programs like Notepad and those whitelisted in pcamain.sdb. Patching Windows system DLL files is probably a bad idea, and I take no responsibility if your computer explodes after you take the following steps. Warning: If the existing bytes don’t match with what I’ve written above, don’t overwrite them! The addresses change with patches to Windows. The above addresses were current as of 2013-09-04. These two bytes are in the CLayerUIPropPage::Initialize function – this basically does a bunch of checks to determine whether the property sheet should be displayed or not. The original code (0x8B …) sets the return value (the EAX register) to the result of these checks – a non-zero result means the sheet won’t be displayed. We modify the function to always return 0 by using the instruction xor eax, eax (0x31 0xC0).